Lentil bake is easy to make but does take a little bit of time to prepare. I often make it at the weekend for lunch and then freeze the leftovers in individual portions. Freeze on a baking tray until frozen and then transfer to a ziplock bag or freezer container. Alternatively, you can refrigerate the leftovers for 3 to 4 days. Although I prefer it straight out of the oven it still tastes good cold and the boys are more than happy to eat it. 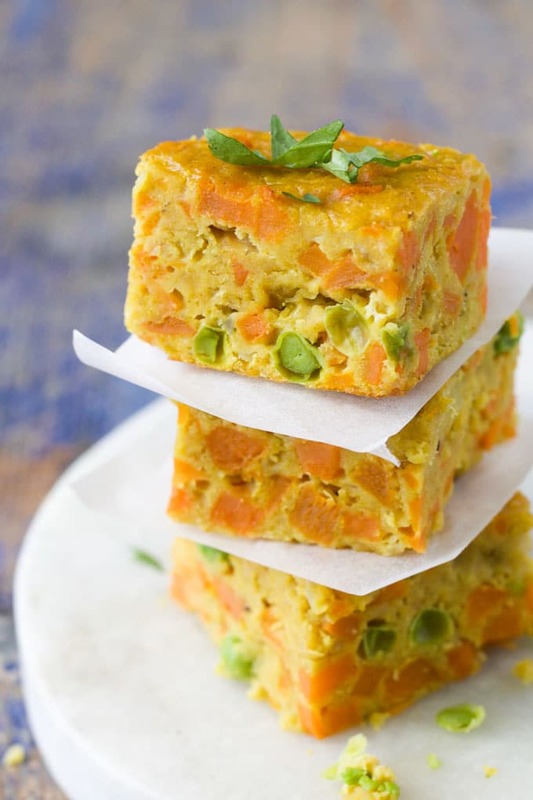 If you are looking for non-sandwich ideas for lunch-boxes then this dish is perfect. Lentils come in a range of sizes and colours. In this recipe, I chose to use red split lentils. When they are cooked they go mushy and the texture is perfect for a bake. The smooth texture is also baby and kid friendly. As other lentil varieties hold their shape more when cooked, I do not recommend using a different lentil type in this recipe. Are lentils good for babies? Lentils may be small but they are a great source of fibre, protein and minerals all of which babies need for proper development. Lentils do have a reputation for causing gas and it is often recommended not to introduce lentils until 8 months of age. Red lentils are lower in fibre and are therefore believed not to cause gas as easily. Start by giving your baby a small amount of lentils, if there is no symptoms of digestion upset then try offering a little more. Have you made this recipe? I’d love your feedback or why not tag me on Instagram or Facebook, I love seeing your photos! NOTE: This recipe was first published on Jan 25th, 2016. It has been updated with new photos and now provides more information, answering some commonly asked questions. Thank you! Sorry I’m hopeless at guessing, I need something to follow! Keep up the good work, your recipes are fantastic! Hi Gemma, thank you! I’ve actually just checked my note book (where I jot down the recipe and I didn’t actually use the pepper. Sorry for the confusion. I’m sure it would be fine to add it though! Mixture be when it comes out of the oven? Does it set up more on standing or should it already be very firm? I’m trying a vegan version without the egg, using egg replacer instead. Sorry for the late reply. I did reply earlier but I couldn’t have had good wifi as it hasn’t seemed to have posted. The mixture should be set when coming out of the oven and not wet. It should be easy to cut. How did it work with your egg replacement? Hi just wondering how the recipe worked with the egg replacer and which one you used as my LB is awaiting allergy testing for egg so have to leave it out his diet. Would this work as well in mini muffin tins? I’m not sure how this would work in muffin trays, sorry. They may be hard to get out of the trays. They would maybe work in a silicon tray. Let me know if you try it. Thanks! Just made this and my almost 7 month old loved it, as did my partner! I did not have any low salt stock so just used water, and added a little pepper and indian spices as never had mild curry powder and still tastes yumi! Just wondering do you think it would freeze or have you ever frozen it? Lots left and would be good to save for a meal next week. Hi Rosa, any feedback on how this froze? Also, I can’t find red split lentils anywhere, can I use green ones? Hi Kimberly, I haven’t actually tried this with green lentils. I’m sure it would work but the texture will probably be different. 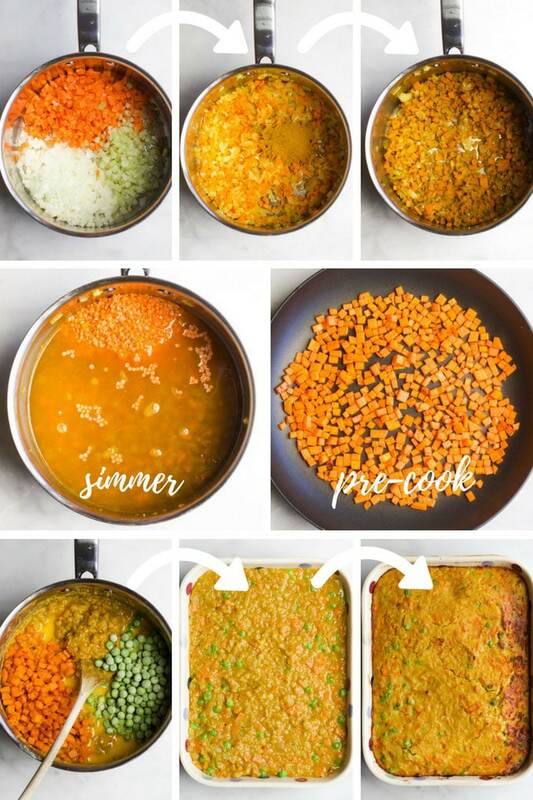 Green lentils tend to keep their shape when cooked whereas red split lentils form more of a thick puree. You may also need to cook the green lentils longer. Let me know if you try it and if it works ? i can’t find split red lentils. what should i do? Where are you from? Do you have a health store close by or an Asian supermarket? You can often find them in the Indian section of supermarkets. Red lentils cook quicker and go softer than other lentil varieties so I don’t think substituting them would be good in this dish. Amy, this is now my 8 month old’s favourite lunchtime meal. I’ve baked it every week for the last month and he devours it down (me too, if I’m being honest). Thanks for the recipe. Hi Jonesy, I’m so glad your 8 month loves this! (and you!) Thanks for taking the time to let me know ? P.S. where did you get the packed lunch box from? It’s a Yumbox. I have two and my second has more compartments. I think I got them from amazon. A little pricey but worth it in my opinion! This is delish! Everyone loved them from our youngest who is four to our picky twelve year old and my mother. The only change I made was to use butternut squash instead of sweet potato since that is what I had on hand and canned sweet peas. I baked them in a muffin tin to make individual servings and it came out great. They held together and were easy to pick up and eat. These will become a staple in our house. Hi Bre, I’m so glad you loved them and they were approved by your kids too. I must try them with butternut squash next time and I like the idea of individual servings! Thanks for your feedback. Hi Pamela, if making for a 7.5 month then you could just substitute with water or use home made stock. Hope it is a success! Thanks Nadeen, I’m so glad you like the recipes and hopefully hubby comes round to eating his veggies soon ?? I just wanted to ask roughly how much sweet potato? I often but them but the size can vary immensely. I finally got around to making these today! Well, I made the entire mixture (sans eggs) last night and then combined and baked it today. We all loved these, especially Miss One who I’m afraid has been a little neglected in the tasty foods department. I think she really appreciated some flavour. I love that this recipe uses lentils where others would use flour, makes it so much more nutritious. I used water instead of stock and a combination of Indian spices instead of curry powder and it was still delicious and flavoursome. I also used 150g worth of sweet potato and it was perfect 🙂 Some of the sweet potatoes I buy a three times that size so I’m very glad I asked. We have and love our YumBox too!! Thanks for the feedback Emily! You have been busy working your way through the recipes, so glad you are enjoying them! Thanks Chloe! Ha ha, delicious for adults too ? Hi is it 180 fan oven or without fan? Hi Fiona, I use a fan oven. Has anyone tried freezing these? I like to make and freeze big batches of toddler food… Thanks! Hi Madeline, I can’t remember if I have frozen this before. I usually cook it for dinner and then have it for lunch the next day! I’m pretty sure it would freeze well. I really dig lentil bakes. I tried to throw a Mexican inspired one together myself but it didn’t set up into bars as I expected. I think perhaps I didn’t use enough egg whites. It was still really tasty. At any rate I am hoping you might invent some variations to this or if you could recommend some substitutions. I am thinking of trying a mushroom and kale lentil bake with either squash or sweet potato, garlic and onion. I am just unsure of proportions. Mushrooms cook down quite a bit but kale not so much. What do you think? A healthy handful of kale and a 1/2 cup of sauteed mushrooms? Thank you, I’m sure you will enjoy the leftovers! I hope your toddler gives it the thumbs up! So glad I found your website. wonderful healthy recipes. I first stumbled upon the apple cinnamon crisps, I was like this is brilliant. I can pack this as snack for my kiddo to daycare on those days when the daycare is serving not so healthy snacks. 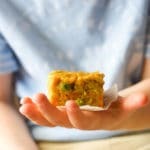 Then I came across the mango coconut breakfast bar, then lentil spinach pancake — I found myself book marking recipe after recipe. This is just amazing. I don’t have to wonder anymore what to pack for daycare. Thanks so much. This means a lot to me. Thank you so much for your kind feedback. It really means so much to receive messages like this and makes running this blog worth it. ? I’d love the make this recipe for my 15 month old but he is allergic to eggs! Do you think it would be okay to use an alternative (flaxseed egg) or can it be omitted entirely? Hi Lucy, I’m not sure how a flax or chia seed egg would work in this. I’ve tried them in cookies but never in a dish like this. I would say it would def be worth a try. Sorry I can’t help you anymore, I should really do some more experimenting with egg substitutes as I get asked this a lot. Having recently found your blog i was so excited to try this…esp w my own Fionn!!! Well he loved it and at 6 months i am happy to get anything near his mouth as most things seem to just be flung overboard. It was a hit w his 8yo sister who detests eggs so a double win for us!!! Thanks for such great family style blw recipes. Looking forward to many more!! Hi Amy, I have never tried a different binder with this unfortunately. I would say a chia seed egg or flax seed egg could work. You could maybe try cream cheese too. Hope it works for you, please let me know ?? This looks delicious! Do you think it’d work with drained canned lentils? Thanks Liz, I have never tried it with anything but the red split lentils so I can’t say how it would turn out. I have never really used canned lentils before so can’t really say, sorry. If you do decide to try, i’d love to know. I know this post is old but I just wanted to add I made this with a chia egg ( I used 2) it didn’t hold together as nicely as in the photos but enough that my 11 month old could pick up little bites. That said it held together well when cold. This will be added to my regular rotation. Thanks for the recipe. Hi Jen, thanks for letting me know. I get asked a lot if egg replacements would work so it is good to have this feedback. Glad you enjoyed it ?? Just wanted to let anyone else know who is wondering, I cooked this up last week and just thawed a serving I froze and it came out perfect. I just cut what was left when fresh into portions and froze on baking sheet with wax paper then transferred to ziplock bag. Recipe is absolutely delicious by the way, I’m a vegetarian and husband and baby are not and this was the first thing I’ve made that I could really get on board with; yummy, healthy, and filling. Love trying out your recipes! Thank you so much for the feedback Devin and I’m so glad you have found something that you can all enjoy. 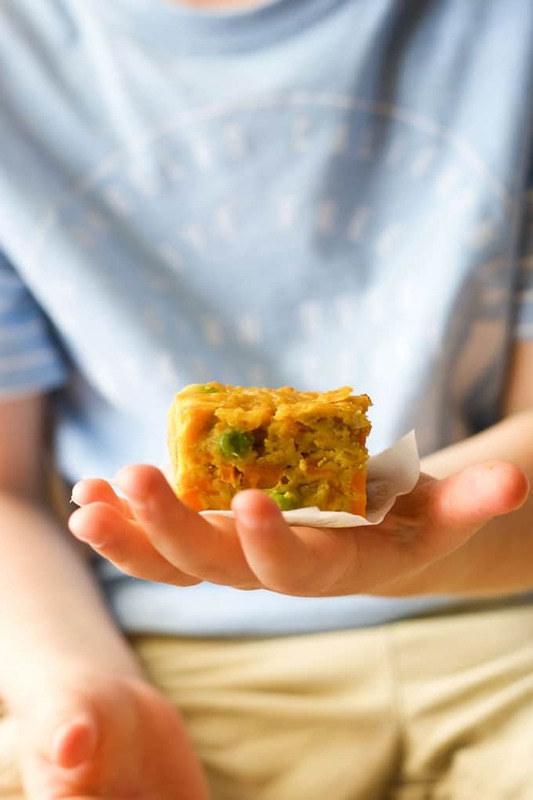 I love to pop squares of this in my son’s lunch box, freezing in portions is great for this. Hey! Did you reheat it after you thawed it? If so how did you reheat it and for how long? Also did you thaw it in the fridge overnight m? Sorry I’ve been searching on this on how to freeze and thaw as I’ve made 2 batches now and ended up throwing loads away! These look absolutely amazing!! Really I can’t wait to try it! , thanks for sharing !! Thanks Aria! You are so sweet! Thanks for the feedback Amanda, people are always asking for egg replacement so it is good to know what does and doesn’t work. Glad you enjoyed the flavour regardless. Hi Briony, I have frozen this lots of times but have only eaten it cold after freezing. I can’t say for sure but I’d guess around 20 mins at 180c covered with foil. Alternatively you could microwave until piping hot. Hi Aj, Thank you! Sorry for just getting back to you now. I had major mac book issues and I am now writing this message from my shiny new one! Did you try it? I’d have thought that if you added the sweet potato to the simmering pot that it would be too wet a mixture. I’d be interested to know if you tried it and how it worked out. Hi Jo, So happy you like the recipe. We usually just eat leftovers cold. If re heating I’d use the microwave. Could I make this in the pressure cooker ? Hi Anne, I haven’t a great deal of experience cooking with a pressure cooker so can’t say, sorry. I’d love to know if you try it! Brilliant! Thanks so much for letting me know, it makes my day! I have made this for lunch today it’s baking in the oven. Husband approves of the taste so i’m sure it will be a hit. It’s great to try kids with mild spices, they can surprise us with their palates sometimes. Also wanted to say that your website is amazing, it’s the one kids food site I return to frequently. From a fan in Ireland. My daughter is allergic to eggs. Is there anything I can substitute for the eggs in this recipe and it still work? Hi Deanna, I haven’t experimented with egg replacements in this recipe. I know a reader tried a chia egg and it didn’t hold together as well as with the egg but her baby was still able to pick up bites. My child is allergic to egg. Is there something to use in place of egg? Hi Robyn, I haven’t tried an egg replacement in the recipe so can’t say how alternatives would work. I know someone has tried a chia egg, it worked and tasted good but didn’t set as well. My 10 month old loved these. I’ve been struggling to get her eating veggies except in puree form so this is great. I didn’t have curry powder so just used turmeric, cumin & coriander powder instead. Love these! They are in the regular rotation for my 1 year old. Instead of pan frying potatoes, I throw the steamer on the pot while the lentils cook. Just a wonderful recipe – thanks!! Lovely recipe! Have made these and frozen them… now wondering how to reheat? I’m sure my 9 month old little boy is really going to love these! My baby (13 months) adored this meal! I added rice and extra veggies and omitted any salt.